Patients with diabetes mellitus are at particularly high risk for cardiovascular disease. Although global risk factor scoring systems, such as the Framingham Risk Score, are well established for screening asymptomatic adults, they are not as predictive in diabetics. Therefore, there has been considerable interest in new screening tests to establish cardiovascular risk in diabetics. Coronary artery calcium assessment, both baseline levels and progression, have been shown to be additive to risk factor scoring systems and are independently predictive of cardiovascular mortality in diabetics. 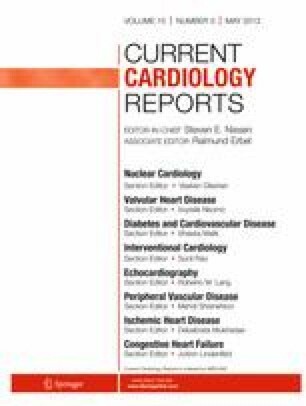 Current American Heart Association/American College of Cardiology Foundation guidelines recommend coronary calcium scoring for asymptomatic diabetics. Myocardial perfusion studies are recommended for patients with a coronary calcium score >400 but the level of evidence is poor. The data for other screening tests is limited. Further research is required into assessing what would be an appropriate follow-up duration for serial coronary calcium scanning. Haider Javed Warraich declares that he has no conflict of interest. Khurram Nasir declares that he has no conflict of interest. National Diabetes Information Clearinghouse. Diabetes across the United States. Accessed at http://www2.niddk.nih.gov/populations/index.htm. Accessed Dec 2012.